Brand new E-Bow Plus (Electronic Bow) with 12 month warranty. 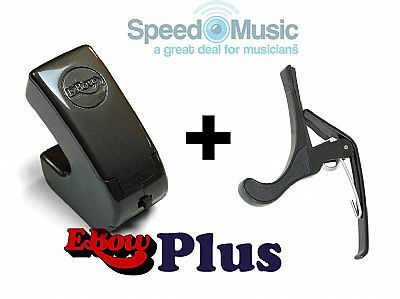 The EBow is a hand-held electronic bow for guitar. The small battery-powered unit replaces the pick in the right hand, letting the guitarist mimic strings, horns, and woodwinds with unbelievable sensitivity. The EBow produces a powerful infinite sustain, rich in harmonics for incredible guitar sounds. How it Works: Welcome to the world of Direct String SynthesisTM. The principal is simple: a focused feedback loop directed at a single string. This produces a powerful, infinite sustain, rich in harmonics for incredible guitar sounds. It's like amplifier feedback with greater control and predictability, at any volume, even through headphones. This hand-held synthesizer provides an amazing variety of textures and tonal slurs - virtually an instrument in itself! Direct String Synthesis: A synthesizer in the palm of your hand. Complete control over attack, decay and dynamics , as well as a whole new range of tones and textures, makes the EBow one of the most expressive tools ever designed for guitar. Whether sweeping smoothly from voice to voice or jumping from sound to sound, this device is responsive and personal enough to reflect your playing style. Test of Time: Since 1976, the EBow (E-bow) has been making music. Groups such as U2, Big Country, Blondie, Elton John, Van Halen, Phil Collins, Queen, REO Speedwagon, David Bowie and Blue Oyster Cult, just to name a few, have thrilled their listeners with the sounds of the EBow. Buddy Emmons uses his on steel guitar. Chris Proctor EBows his acoustic guitar. Windham Hill's Michael Manring has even figured out how to use one on bass guitar! 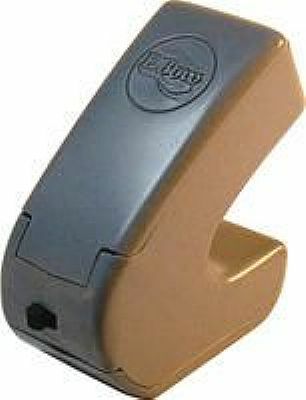 The applications for the EBow are diverse. The EBow now comes with a complete Player's Guide booklet and detailed audio lesson by EBow virtuoso Lenny Walker. How does he get those sounds? Now, Lenny shares his secrets in this feature- packed personal EBow lesson-by the master of EBow technique. A useful addition to any guitar player's effects board, a great Christmas or birthday present for guitar players. 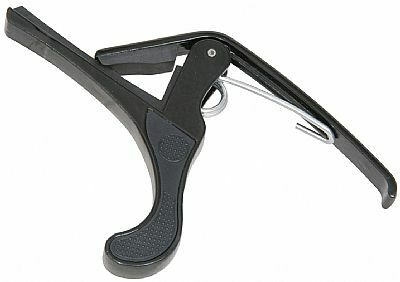 A quick release capo for acoustic or electric guitar. 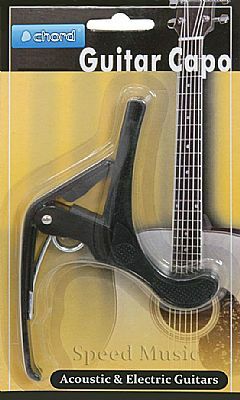 Squeezing the 2 levers together releases grip on the guitar neck, allowing easy removal or replacement and quick position change.